This 52' Maritimo Motor Yacht BELLISSIMA was a fresh water boat for most of its use. It was kept in Ohio, lightly cruised on the fresh waters of Lake Erie from when the boat was new until September of 2015 when the boat was moved to Florida. While in Ohio, each winter the boat was stored inside a heated building. Since arriving in Florida the boat has had light use and was kept at a dock behind the owner’s house. The engine room is spotless and the total hours are less than 400 on both the engines and generator. United Yacht Sales New Jersey would love to guide you through a personal showing of this 52' Maritimo 2009. 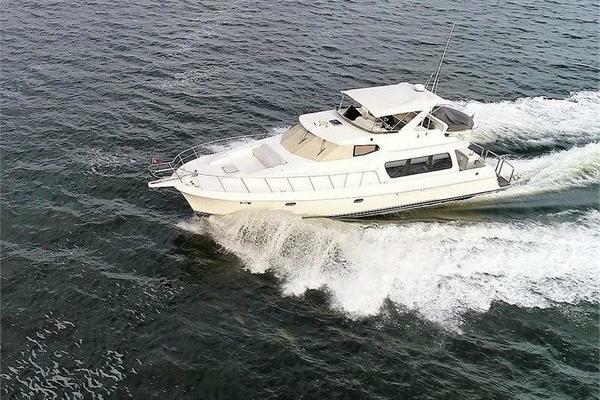 This yacht for sale is located in Punta Gorda, Florida and priced at $799,900. For a showing please contact us by filling out the form on this page and we will get back to you shortly! A few steps forward brings you into the main salon. The setup here is to give lots of room for seating with an “L” shaped couch to port and another “L” shaped couch with a table for dining or snacks to starboard. Both couches have storage underneath and there are additional storage areas in the forward section of the salon.To port is the entertainment area with television on a lift.One of the most interesting design features of the 52 Maritimo is the stairway to the enclosed flybridge that is inside the salon. The stairs are wide and deep with good handholds for moving up or down in a seaway. Being inside, these stairs will not get wet so they are much more secure, with good nonskid. Since they lead to the enclosed flybridge there is no need for a door at the top of the stairs making it easier to get to the skylounge. The bridge becomes a more comfortable area to run the boat, similar to a raised pilothouse on a 100 foot yacht. Air conditioning with reverse cycle heat make this area comfortable in all weather. With real windshield wipers on real glass windows the visibility is actually better than isinglass with spray or rain. Maritimo promotes this boat as a long distance cruiser and the enclosed flybridge or skylounge as some call it, allows you to run for many hours without wind and weather in your face and in much quieter conditions. If you might have had too much ocean sun over the years this may be more dermatologist friendly also.There are two large Stidd helm seats, one for the skipper and one for an observer. Behind the helm seats is an “L” shaped couch with long rectangular table, great for laying out charts for trip planning or for meals when underway. A sink with counter area is opposite, and below the bench seat a Fritigo refrigerated drawer for cold drinks or wine bottles. Forward of the stairs on the port side is another bench seat.At the aft end of the skylounge is a sliding door to give access to the upper back teak deck. If you have been in a regular aft deck cockpit tied to a fixed dock, and the view was to look up at the underside of the dock, you can appreciate how nice it would be to have this upper level seating area. Located here to the port side are remote engine controls making this a location with good visibility to make a landing or back into a slip. The remote control bow and stern thruster on a lanyard around your neck allows the skipper to move the boat closer to the dock from anywhere on board. Another set of remote engine controls are in the cockpit. A canvas sunshade helps shade the aft sliding doors and there are full see thru sun shades for the front and side windows. If you want to bring the boat alongside a dock on the starboard side the window next to the helm slides open so the skipper can look out to see exactly how far the dock is from the side of the boat. The master stateroom is mid ships to the port side. The raised island queen size berth is a walk around with plentiful storage areas and good lighting for reading. The en-suite head has a glass stall shower and molded fiberglass floor. Most of the interior of the head is actually molded fiberglass for ease of cleaning with high gloss wood doors and wood trim. The sink is clear glass for a dramatic look. The bed has storage underneath and is mounted with gas assist rams to lift the entire bed high enough to step down into this space. There is plenty of room here for storage of blankets, suitcases and more plus there is a cedar lined hanging locker for clothes.For entertainment there is a BOSE stereo system and flat screen TV.The VIP stateroom is forward with a raised island double berth with custom mattress. There is a cedar lined hanging locker and storage cabinets to port and starboard. The head with molded fiberglass walls and high gloss wood trim and doors is en-suite with a second door to make it available to the third stateroom. The stall shower has a glass door and one side is glass to give a more open look to the head.The third stateroom has upper and lower single berths. There is a wall mounted TV and stereo. In the closet is a washer dryer and storage area for more supplies. Maritimo has come up with an extremely safe and easy deck plan for access to the bow. When walking forward there is a recessed walkway on both sides of the boat. No standing on a narrow walkway holding to the rails for security, the stainless rails are mounted on a fiberglass bulwark to make them waist high when going forward. Somewhat like a walk around side deck on a motor yacht, going to the bow to handle lines when docking is safe, comfortable and secure.The aft cockpit is teak with a large center hatch on gas assists for access to the engine room. There is a remote engine control station for docking located here. Aft is a electric griddle, sink and refrigerated compartment. Access gates to each side allow you to get to the swim platform with swim ladder. To both port and starboard are storage compartments for cleaning supplies and more. The 240 volt 50 amp shore cord is retrieved with a Glendenning Cablemaster with remote control.The engine room on this boat is extremely clean and rust free after being a Great lakes boat for most of its use. Instead of painted bilges, Maritimo use molded gel coat panels for the floor for ease of cleaning and care. There is good access to both sides of the engines with batteries in raised boxes out board of the main engines. There is full insulation in the overhead cover with vinyl fabric to help keep the engine room clean .The fuel tank is forward of the main engines to help balance the weight of fuel no matter how much fuel is on board. Fuel capacity is 1017 gallons which is high for a boat this size with engines of 715 HP. Range at 19 knot cruise burning 40 gph is around 450 miles with a 10% reserve.There is another large hatch in the cockpit teak deck for access to the lazarette. Two plastic water tanks are here, the holding tank and macerator are here and lots of storage. Molded in fiberglass on the underside of this hatch is a compartment to hold two dock fenders. Fireboy Halon System Automatic & Manual OverrideDelta T Engine Room FansRacor Fuel filtersOnan Generator 21.0kw with 400 hoursCustom Safety RailingsReverso Oil Change SystemCharles ISO Shore Power ConditionerFuel Level Calibrated Site GageProprietary Power Steering System from Maritimo Offshore Racing TeamMain salon air conditioning- BTU: 20,000 estBridge air conditioning - BTU: 12,000 BTU est.Forward air conditioning cabin- BTU: 16,000 estMaster stateroom- air conditioning BTU: 16,000 est. The Maritimo 52 MY is one of Maritimo Offshore's most popular designs. Built to handle heavy weather this vessel has an enclosed bridge and enclosed staircase. Wide bow flare makes for a dryer ride and docking made easy by two docking stations and remote thruster operations.Her interior is designed to maximize livable space with optimal storage. Polished wood throughout raises the bar for comfort and style. Galley aft is non traditional and makes good use of storage and design. Cabin space has side wing doors for side deck access. Aft sliding door goes to cockpit with docking station and BBQ.Staterooms include owners, guest and bunks which two full heads support. Washer dryer and dishwasher make living aboard easier for longer trips. Large fuel tank and water tanks give this vessel a longer range away from the dock. Power is high output Cummins QSM11 turbo's with 715 hp each. Onboard power is 21.5 kw Onan which is ample to keep the AC's running and the services working.From its ingenious design and thoughtful engineering to the swathe of lavish appointments from the water up, everything aboard the Maritimo 52 has been designed with one thing in mind - long-range luxury cruising. However, with four entertainment precincts, partying with friends also comes naturally. On the main deck, rear doors slide right open to expose the cockpit, island barbecue and access to the swim platform while the flybridge is capable of accommodating as many guests as the saloon - and has its own balcony. On a Maritimo, performance is also part of the entertainment. Open the throttle and the 52 eases quickly up to cruising speed. With engines positioned forward to give the shafts a minimal 9 degree entry, the five bladed props can attack the water at the most efficient angle. The variable deadrise hull ensures the transition from sub-planing to planing speeds is effortless and the combined set-up delivers poise, balance and unrivalled fuel efficiency. In fact, no other motoryacht looks, feels or performs like it.